Tomorrow we launch Run An Empire to the world. That means the app will be available to download for free from the Android and iOS app stores. Players everywhere will be able to control their own digital empire. We’d love your support to help with launch. Share your story – if you’ve been enjoying Run An Empire then share your story on social media. Tell the world why you love us, show off your empire or challenge a friend. Just be sure to tag us and each day this week we’ll be sharing the best stories on our channels. Give us 5 stars – head to Run An Empire on the AppStore or Play Store and leave us a review. The better the ratings, the better our chances of getting featured. Local coverage – going live in so many territories is really exciting. We’d love to speak with local press, bloggers or runners in your city, state or region. There is a launch press kit here or get in touch with us directly. Thank you for any support you can give, the more people we can get playing, the more fun the game becomes. Rachid Schrik – Run an Empire lets me run at my pace but still have the feeling that I’m competing with the best of them, since speed isn’t the most important thing. I notice I’ve been running twice a day quite often since I started playing. When I walk with my daughter she does a victory dance every time we capture a new castle. Kerry Milauskas – I absolutely love this game, it’s so addictive! I was diagnosed with Fibromyalgia 2 years ago and my doctors and physical therapist all kept telling me the more I exercised the better I would feel. Now with Run An Empire I’m exploring parts of my city that I have never gone before just to get new land. I was tired one day and thought that I would just do a short walk but then I saw a castle nearby and extended my short walk to 3 miles. If I get enough money for a new building but I don’t have enough land to place it I will fit a second walk into my day just to complete it. This is the motivation I needed to get myself back onto a healthy track while still having fun doing something I like. The best part is, the doctors were right, walking has helped my pain a bit and I feel really accomplished when I finish a run. The beta will continue unchanged for the foreseeable future. That means if you’re on the beta and you prefer to test features before live players (and don’t mind a few bugs) you don’t need to do anything. Just keep playing and giving us feedback. 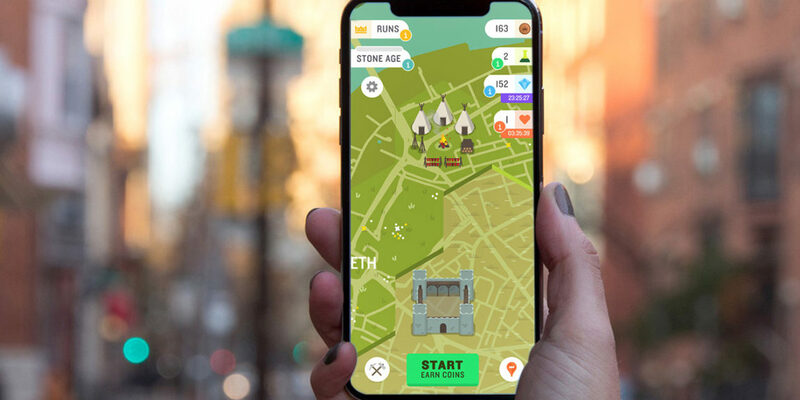 Run An Empire is a free to play game for Android and iOS where players claim land in the real world by running, jogging or walking. Players are rewarded for their activity with ownership of the areas they visit, which can then be customised with a range of buildings from stone age huts to futuristic space ports. As they run and their empire expands they earn money to advance their city into the modern age. The most competitive players can compete to capture buildings, or collaborate to take on local challenges. Run An Empire fits into existing exercise routines, whilst giving new runners an incentive to get started. Players can capture territory on their walk to work, their weekly jog or as part of their race training. Getting started is easy – players open the app whilst on the move and it tracks in the background like Fitbit or Strava (runners can even link the app with their Strava account). Once home players can build, maintain and customise their empires.